Art therapy is an approach to therapy that combines elements of psychology with artistic expression. It allows you to explore various art materials and the artistic process to facilitate expression and bring about insight, awareness and positive change. How is Art Therapy different than an art class? The main goal of Art Therapy is to encourage expression rather than the creation of a “beautiful” work of art. With Art Therapy the process of creation is just as important as the product itself. There is a greater freedom with the artistic process and the choice of imagery, and the process is directed by you, with the support and guidance of your Art Therapist. Why is Art Therapy effective? A picture is worth a thousand words: art is a powerful substitute for verbal language at times when it can be difficult for you to verbalize your feelings or experiences. Art Therapy can also help you to access different parts of yourself that may not surface through words alone. 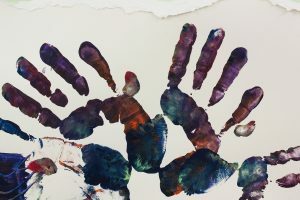 Traumatic events and early experiences are encoded in non-verbal imagery which can difficult to express through words; art therapy offers a safe space where you can begin to address and heal trauma through art. Art therapy can help to increases your vocabulary of expression by allowing you to experiment and practice this nonverbal form of communication. It can also allow you to get to understand yourself on a deeper level while giving you access to new tools to express yourself in a whole different way. The artwork can act as a container for overwhelming emotions and experiences that are beyond words. These difficult emotions, experiences or traumas can be externalized so that you can generate some distance from them to examine and process the feelings with greater control. The art work serves as an outside vessel to hold these feelings and experiences, allowing you to step away from them, and later come back to look at them from different perspectives. The physical process of creating art can help you to expel and get rid of pent up energy or emotion that you might be holding inside. Art therapy can help you to find ways of using visual expression to give shape to negative emotions or thoughts that can otherwise feel unacceptable or “taboo”. At the same time, engaging in creative expression and art making can be a very soothing and relaxing activity which promotes a greater sense of well-being. One of the goals of art therapy is to create a positive and warm environment to allow you to explore and develop your own creative process, and helping you to connect to parts of yourself that you may not have been able to access in other ways. Art therapy connects you to your body through the physical act of art making, to your deeper emotions that may exist beyond words, and to your creativity which can energize you, sparking new insights, awareness and positive change.